Recent release “A Boxer's Dream” from Page Publishing author Alvin Bolton is both enlightening and motivating; this work explores the sports of boxing while addressing some of life’s greatest lessons. 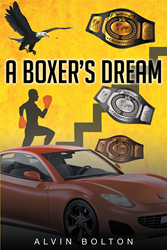 Alvin Bolton, a devoted writer and author, has completed his new book “A Boxer's Dream”: a passionately crafted work that illuminates the struggles and happiness of life, love, success and destiny. “A Boxer’s Dream is about a young man’s trials and tribulations both in boxing and the life skills necessary to reach the pinnacle of boxing success. Along with “learning on the job” about living overcoming the obstacles along the way. Although a story of fiction, many incidents and interaction depicts my personal history and incidents of people I know and have known overcoming adversities,” said author Alvin Bolton. Published by New York City-based Page Publishing, Alvin Bolton’s gripping work narrates the main character’s experiences with overcoming life’s struggles. A story that details the struggle of a family and mostly as son who endured hardships and difficulty, but was determined to work hard enough to succeed in boxing, climbing his way to the top. The life skills he learned along the way, he used to his advantage. Never giving up! He climbed the ladder of obstacles. Readers who wish to experience this profound work can purchase“A Boxer's Dream” at bookstores everywhere, or online at the Apple iTunes store, Amazon, Google Play or Barnes and Noble.